Fourteen months prior to presidential contest, key questions remain: who will be able to vote, and will their votes be counted accurately? COLUMBUS, Ohio — The offices in a former Kohl’s department store here look inconsequential enough — linoleum floors, fluorescent lights and cookie-cutter furniture. But what happens in this strip mall, and other equally nondescript settings nationwide, could in fact be crucial to the struggle over America’s voting laws and apparatus — a struggle that may go a long way toward determining the outcome of next November’s presidential election. The Franklin County Board of Elections moved to the north side of this capital city last year after using the site in 2012 to accommodate the rush of people who cast their ballots during Ohio’s early voting period. But that early voting policy is still not set in stone — its duration and details have been stretched and squeezed repeatedly over the past few years by both state law and court order, part of a bitter clash between Democrats and Republicans over access to the ballot, electoral integrity and resources. Meanwhile, some 80 miles to the north, in the rolling farmland of Ohio’s Amish Country, the Holmes County Board of Elections is engaged in a separate but related conflict, strategically pinching pennies and holding off purchases of printers and other items in hopes the county can scrounge together a few hundred thousand dollars to replace its aging voting machines. From Cleveland to Cincinnati, Toledo to Dayton, the stories are similar. 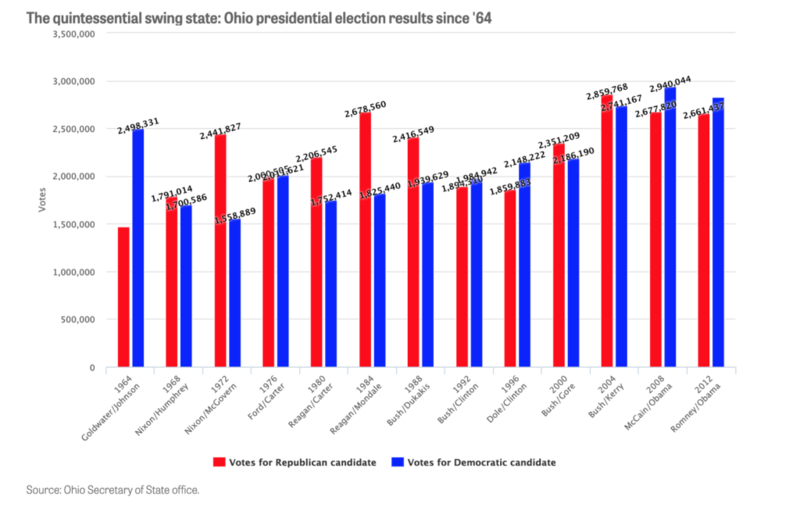 Most of the Buckeye State’s 88 counties share these election-related dilemmas, and that’s critically important, since no presidential candidate has won the nation without winning Ohio since 1960. After a thin margin of error and widespread dysfunction at the polls tarnished election results here in 2004, state lawmakers enacted a series of reforms. But over the past few years, Republicans have been chipping away at many of those changes. GOP leaders say they’re simply trying to guarantee uniformity and prevent voter fraud, but voting rights advocacy groups say the recent changes threaten to bring back problems from the past, and may really be driven by an effort to suppress voter turnout. Meanwhile, Ohio leaders are largely ignoring what a bipartisan federal panel called an “impending crisis”: voting equipment that’s at least a decade old and in need of replacement. And Ohio is far from alone. Politicians and advocates are waging similar battles across the country, where state legislatures continue to fight over the rules — voting hours and required identification — and argue over money to replace broken down voting equipment. But the stakes may be highest here, in perhaps the most important of swing states on the national electoral map. With voting laws in flux and funding a constant struggle nationwide, two central questions remain just 14 months before Election Day: who will be able to vote, and will all their votes be counted accurately? In 2004, though, problems emerged again, this time in Ohio, where a combination of robust turnout and poor planning and administration led to long lines at polls. Some people in Knox County, near Kenyon College, waited as many as 10 hours to vote. The margin of victory was less than 120,000 votes out of 5.6 million cast, but despite widespread concerns among Democrats that the lines and other problems had sullied the vote, John Kerry conceded the state to Bush the day after the election (he later supported a recount, which confirmed Bush’s win). Those lines prompted Barack Obama in 2013 to appoint the Presidential Commission on Election Administration, which held a series of hearings and pulled together relevant research to create a list of best practices. 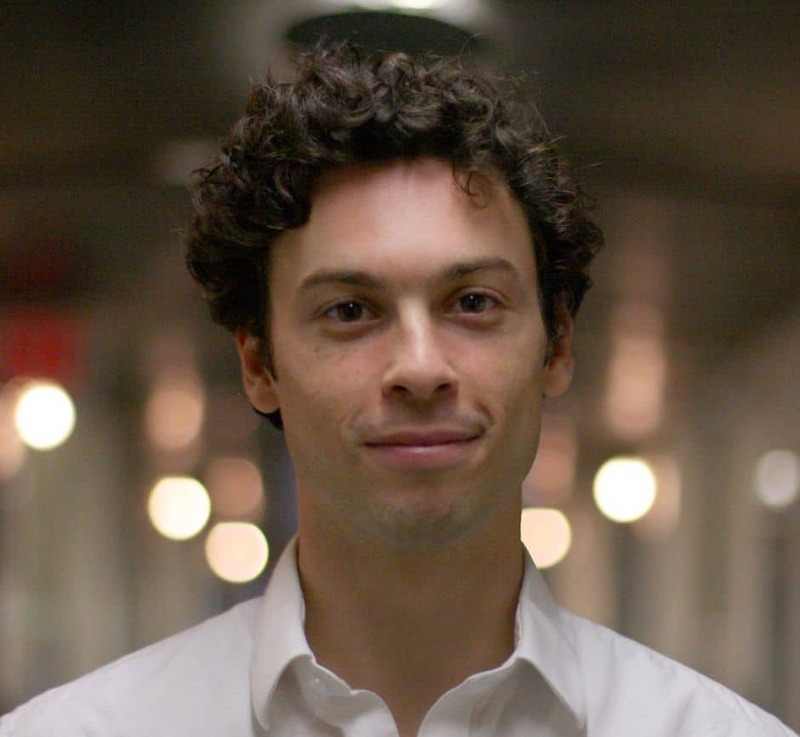 The commission noted that many issues — a dearth of data, uneven resource allocation, poorly maintained registration rolls — were rooted in the system’s decentralization, and the panel published a lengthy list of recommendations, including allowing people to register to vote online and expanding early voting opportunities. But perhaps nothing the commission said was more unsettling than the “impending crisis” it identified with the nation’s aging voting infrastructure. Ohio’s county boards of elections are divided evenly between the two major political parties. In Franklin County, officials keep party-apportioned keys in a lockbox and require one of each to open certain doors, an approach more common with oversight of nuclear weapons. On a bright June morning the room served as staging ground for a public voting machine test, which counties must perform ahead of each election. No one showed up to watch, but at 10 a.m., part-time staffer Betsy Hall began setting up an AccuVote TSX, the county’s electronic voting machine. Its plastic casing was slightly battered but intact and held the touch-screen device itself, which looks like an oversized and outdated children’s toy. As Hall labored with the contraption, Elections Director Lisa Welch emerged from a back room holding a hammer and a white rubber mallet — her favorite office tools, she said with a smile. Election administration requires a rare combination of skills: facility with ever-changing legal statutes, an ability to calm the nerves of tense and confused voters, knowledge of the various IT systems that support registration databases and equipment, management of a large team of usually elderly and often poorly-trained poll workers, and patience for a healthy dose of mind-numbing clerical work. In Holmes County, those tasks fall to Welch, her deputy director and two part-time staff members. Welch likes to say she’s a mechanic as much as anything, however, for all the time she puts in keeping the aging machines running. With a short bob and plastic-rimmed glasses, Welch has a dry but cheery sense of humor. In her spare time, she helps her husband run a pair of lure and bait businesses, from which you can buy concoctions with names like Purrfect and Catatonic or a 50-50 mix of red fox and bobcat urine. The machine test went smoothly. Hall used the touch screen to register four mock votes for an upcoming special election. The device recorded the selections onto a 128-megabyte memory chip the size of a credit card. Welch then walked the chip into a back room that stores the county’s 115-odd machines as well as its central server, which tabulates votes uploaded from the memory cards each election on a 2003 Dell desktop with a defunct floppy disk drive. The computer runs the Windows XP operating system, which Microsoft stopped supporting more than a year ago, making it vulnerable to hacks and viruses. All but four of Ohio’s 88 counties are using machines bought in 2006 or earlier, and according to the association survey, only 14 counties have a plan to replace them. The stakes are especially high in Franklin County, where 4,700 iVotronic touch-screen machines sit in a hangar-like space in the back of that sprawling office on the north side of Columbus. 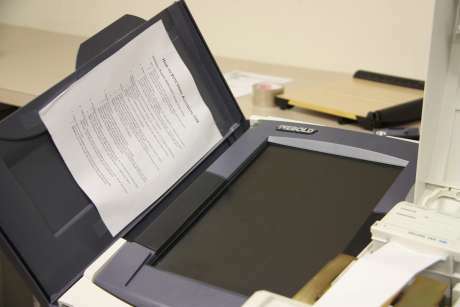 Those machines, which were first used in 2006, serve some 800,000 voters and are aging fast, but there is no plan to replace them, said William A. Anthony Jr., the county’s elections director. A Center for Public Integrity review of Franklin County records showed that poll workers reported at least 105 incidents with voting equipment on Election Day 2014, though some of those incidents involved multiple machines. Anthony dismissed those as mostly minor problems. Still, he says he’s constantly appealing to state and federal officials, telling “anyone who will listen” about the need to replace the machines. The county does not have the money, he said, and there’s been no indication of state or federal assistance. Ohio Secretary of State Jon Husted sounded the alarm two years ago in testimony to Obama’s bipartisan commission. “The next time we go to the polls to elect a president, these machines will be 12 years old,” he said. “That’s a lifetime when it comes to technology.” The commission determined that “a large share of the nation’s voting machines … will reach the end of their natural life and require replacement” by the end of this decade. But despite these broad concerns, the state does not collect data on the condition of Ohio’s machines writ large, and has no plan to purchase new ones. This “impending crisis” regarding voting equipment has its roots in the solution to a previous problem. The 2002 Help America Vote Act provided more than $3 billion to help states purchase new equipment, and the majority of local jurisdictions bought replacements over the next few years — mostly either touch-screen devices like in Holmes County or optical scan machines that record votes from a paper ballot. The result is that, with rare exceptions, the country’s voting machines are all aging out at the same time. The Election Assistance Commission has had its own problems. Before Hicks and two other commissioners were confirmed by the Senate in December, a deadlocked Congress had refused since 2011 to fill the vacant commissioner slots, leaving the body without a quorum and unable to approve new guidelines for machines. As it happened, the older guidelines in some cases precluded machines from incorporating new technologies, such as tablets, Hicks said. And while the EAC guidelines are voluntary, nearly every state requires that machines meet at least some aspect of them, so the delay effectively stalled the market because manufacturers had little incentive to develop new equipment. “These standards that we’re using now were written before the iPhone,” Hicks said. This year, the EAC finally approved a set of guidelines that had been in the works all those years, and Hicks said commissioners are now planning to write new standards that will account for advancements like tablets. States are responsible for purchasing and maintaining their own equipment, and in many cases they delegate the task to the nation’s 8,000 local jurisdictions. While there’s no good data on machine failures, incidents have been popping up all over the country. On Election Day 2014, for example, voting machines in Spotsylvania County, Virginia, started crashing and became inoperable. The state Department of Elections ordered a review that found the machines were highly vulnerable to attacks that could alter vote tallies without detection. The review determined that a hacker could access the machine, called a WinVote, using a USB port or a wireless device (the Wi-Fi password was “abcde”). The machines’ software, a version of Windows from 2002, was easy to hack, as was its database, which was protected by a password that the reviewers cracked in 10 seconds. 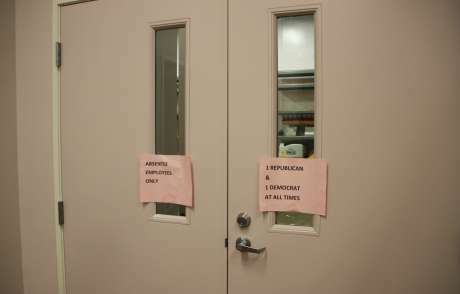 The Election Day problems, however, appeared to have originated when a poll worker used a smartphone to stream music through the Wi-Fi of the library where voting was taking place. The report prompted the state to de-certify the machines immediately — Virginia was the only state still using them — forcing 30 localities to scramble to find replacements. While Ohio’s aging voting machines get comparatively little attention, there’s no shortage of focus on the laws and rules that end up deciding who votes, and under what conditions. It’s easy for the seemingly endless debates over these rules — which cover absentee voting, provisional ballots, registration guidelines and other minutiae — to get lost in a bureaucratic haze. But for Rev. Tony Minor, in what’s becoming a common refrain across the country, there’s a straight line from Selma in 1965 to the present. Minor grew up in Cleveland’s gritty Glenville neighborhood, a hotbed of activism and violence in the 1960s. In 1968, a shootout between black nationalists and the police left seven people dead and led to days of looting. That came two years after riots in neighboring Hough. A decade later, Minor left Cleveland to attend Morehouse College in Atlanta, where Martin Luther King Jr. had earned a degree. He began working on civil rights issues and took part in the Overground Railroad, a voter registration campaign in the mid ’80s led by the National Association for the Advancement of Colored People. He’s now a pastor and the advocacy director at Lutheran Metropolitan Ministry, a Cleveland social service group. But he’s also Ohio coordinator of the African American Ministers Leadership Council, where he works on voter education and registration drives with leaders of the state’s black churches. 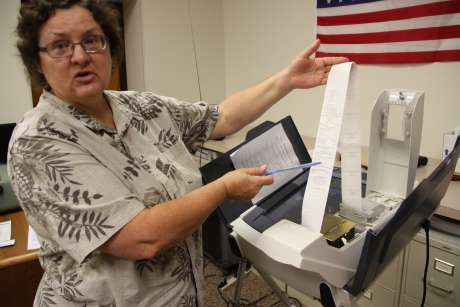 Part-time staffer Betsy Hall conducts a test of a Holmes County voting machine, showing how the AccuVote keeps paper records in case of a recount. Minor’s church serves a down-and-out community, he said, “where inspiring low-income, struggling families to trust the voting process and to utilize the voting process is a continued challenge.” The riots of his youth haven’t returned, but the racial tension has, after a white city police officer, responding to a 911 call last year, shot and killed Tamir Rice, a twelve-year-old black boy who was carrying a BB gun. Today’s fights over laws like early voting trace back to 2004 in Ohio, when most of the longest lines at the polls were in urban areas like Cleveland and Columbus, which tend to have robust minority populations and are heavily Democratic. At the time, Democrats accused then-Secretary of State Kenneth Blackwell, a black Republican, of suppressing the vote after he ruled that so-called provisional ballots would count only if voters cast them in the correct precinct, a decision later upheld by a court. (Poll workers provide these provisional ballots to voters whose eligibility is in doubt, and officials count them only if they can later verify that the voter was indeed eligible. But while federal law requires states to offer provisional ballots, states have some discretion in setting the conditions under which they’re counted.) In addition, a lawsuit brought by the League of Women Voters in 2005 alleged that a shortage of voting machines in certain areas disenfranchised tens of thousands of Ohioans. “It put the black community on notice,” Minor said of the election. Under a national microscope, the state legislature in 2005 approved early voting during a period of 35 days, including one week when people could register and vote at the same time, and opened absentee voting to anyone who requested a ballot. Those two measures became extremely popular — 1.8 million Ohioans voted early or by mail in 2012, casting about a third of all ballots — and are considered the primary reason long lines have not returned. In 2009, the state settled the League of Women Voters lawsuit and agreed to institute a series of reforms, including requiring counties to produce pre-election planning documents and to allocate voting machines based on the number of registered voters (poor machine allocation was a key driver of Franklin County’s five-hour waits). Since then, however, the Legislature has continued to pass smaller-bore adjustments. In 2014, lawmakers eliminated one week of early voting during which people could register and vote at the same time, bringing the period down to 28 days. The same month, Secretary of State Husted (Blackwell, who did not respond to an interview request, left office in 2007 after a failed bid for governor) set uniform statewide hours for voting during the shorter period, barring county election boards from opening during some weekends and evenings. Previously, counties could set their own hours for early voting during the 35-day window, and larger counties like Franklin and Cuyahoga, which includes Cleveland, stayed open during these extended hours. The NAACP filed suit in May 2014, and just this past April reached a settlement with the state that reinstates some of the weekend and evening hours but maintains the 28-day period, without the week allowing people to register and vote on the same day. Several other bills have tweaked rules on absentee and provisional ballots — shortening the period voters have to correct them, for example, and requiring they provide their address, date of birth and driver’s license number or partial social security number on the ballot envelopes. Advocates say these changes increase the likelihood of technical errors that can lead to ballots being rejected. Within hours of that court decision, Texas’ then-Attorney General Greg Abbott, who is now governor, moved to instate a voter identification law that the Justice Department had blocked the previous year (many studies have shown that minorities are less likely to have driver’s licenses or other identification that Texas and some other states require at the polls, according to a review by the Government Accountability Office). Weeks later, North Carolina approved sweeping changes to its voting laws that included voter ID, limits to early voting and ending same-day registration and voting. Conservative groups have claimed that many of these changes help protect against voter fraud, and that there’s no evidence they suppress voter turnout. But the primary type of fraud that would be prevented by an ID law — voter impersonation — is extremely rare, even according to a list of cases collected by the conservative Heritage Foundation, which supports ID laws. The lack evidence has prompted Democrats and voting rights advocates to allege that the true intent of the laws is to suppress the minority vote (there have been more documented cases of absentee ballot fraud). Ohio’s laws may yet change again before the next presidential election. Just weeks after the settlement that established the 28-day early voting compromise in April, a group represented by the general counsel of Hillary Clinton’s campaign filed a federal lawsuit challenging a broad slate of the state’s measures (more recently, that group has sought to withdraw and be replaced by the state Democratic party). 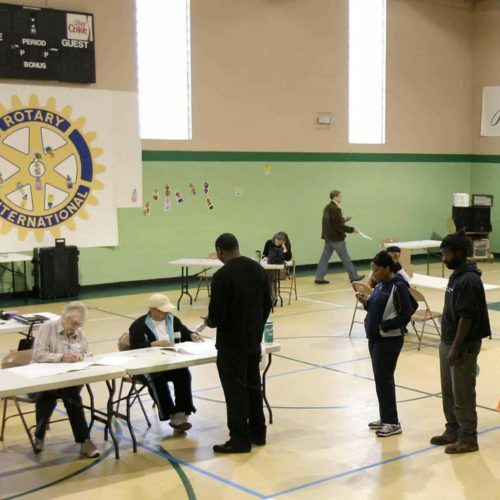 In early August, in a separate matter, the Ohio Democratic Party and two groups representing the homeless filed an updated complaint arguing that the 2014 laws on absentee and provisional ballot rules discriminate against minority voters — the latest step in a years-old federal suit that, in 2010, resulted in a consent decree that has helped determine how the state counts provisional ballots. The Clinton attorney has also filed suit in Wisconsin and Virginia, meaning that in several swing states, voting rules may not be settled until soon before the election. Rulings in any of those cases, or in North Carolina or other states, could also prompt a new wave of states trying to change their own laws, said Hasen, the election law expert. “What you’re going to see is continued litigation, continued experimentation with the kinds of changes that we’ve seen in some places like North Carolina,” Hasen said. The chief cause, he said, is simple: Both parties have determined that making it easier to vote benefits Democrats. The same uncertainty hangs over what types of machines voters will use in 2016 and beyond, said Norden, of the Brennan Center. There’s a “stalemate now between different branches and levels of government as to who’s responsible for paying for this,” he said. Despite all the partisanship, litigation and finger-pointing, both the Buckeye State and the nation have made significant progress over the past decade. At least 28 states have adopted online voter registration, most over the past five years, which advocates say expands access to voting while reducing clerical errors that cause nightmares each Election Day. In late June, Husted, the secretary of state, touted many of these advances before a somber crowd of several hundred of Ohio’s election officials who had gathered for their summer conference in the Archie M. Griffin Grand Ballroom, a soaring space with rectangular, dangling glass-bead chandeliers, on the Ohio State campus. The one-day event serves as a continuing education seminar for election officials. Husted opened the day with a pep-talk during which he repeated favorite catch-phrases such as how the state is making it “easy to vote and hard to cheat,” and stressing that “good enough is not good enough.” Many officials and advocates say Husted appears sincere in his efforts to improve the administration of elections. He has supported key measures pushed by advocates, including online registration, which the state Senate passed in June, and state funding for electronic pollbooks — which replace paper voter rolls and promise to streamline voter check-in and cut down on poll worker error — for which the Legislature approved funding this year. Even the state funding for electronic pollbooks — $12.8 million — has been framed as much in terms of cutting costs as anything else. Counties will no longer have to pay to print extensive paper lists for each polling location and will be able to save time and money due to the comparative ease of updating digital records. Welch was unable to attend the conference — she and her husband had traveled to Indiana for the annual convention of the Fur Takers of America — but days earlier, in her office, she had said she was optimistic her county would approve money for new machines, perhaps within the year. They may only be able to afford them, however, by eliminating more than half of the county’s 17 precincts.